RMB is a small loudspeaker producer in the UK. Mike Cox comprehensively reviewed their 40/4 loudspeakers in February last year. The 22/3 is that model's smaller brother, designed with similar aims in mind, but at a somewhat lower price point. Minimum suggested amplifier rating 15 w.p.c. Enclosure type – Bass reflex . Dual downward firing ports. 18mm birch plywood construction with multiple internal stiffening braces. 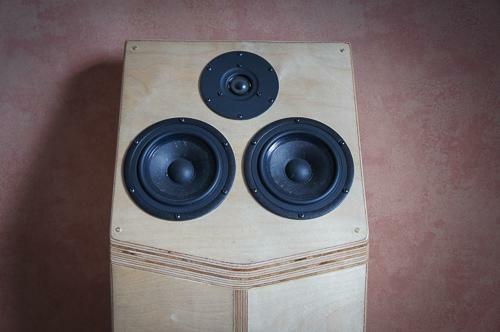 Drive units: twin 145mm mid–bass units with natural fibre cones 28mm fabric dome tweeter with extremely powerful magnet system (modified in house). The model 22/3 is described as well suited to small rooms and valve amplifiers of modest output. RMB will demonstrate the speakers for potential customers at their premises or at the customer's home. Well I could manage the small room, albeit not the valve amplifier. I teamed the RMBs with my regular Cambridge Audio 801A integrated, fed music from a netbook via a Marantz SA-KI Lite (used as a DAC). The speakers are mercifully light to carry, so set up was no problem. The RMB22 is an unusual design. The drivers are set into a sloped baffle which directs the sound above the listening position, except for the bass, which is fed via a pair of downward firing ports. The cabinets are raised above the ground on integrated wooden stands. RMB recommend that the speakers are used more or less flat against the wall. Positioning the speakers in this way reinforces the bass but it doesn't, contrary to my expectations, make it overwhelming. The drivers are arranged in a side by side configuration, with the tweeter centred above them. I had expected this to blur the stereo image but it didn't. Nor did it seem to widen the “sweet spot”, which I'd also thought might be possible. I suspect however that it is largely responsible for the wide and forward imaging noted in the listening tests. These are quite efficient speakers. The specification of 89db was at least borne out, as they were easily driven to significant volumes without taxing the amplifier at all. The cabinets are made of varnished plywood and equipped with black mesh covers that attach to small magnets on the front of the baffle. What appears to be a decorative strip under the baffle and down the centre is actually the layered edge of the plywood itself. The cabinets are available in different coloured wood stains. 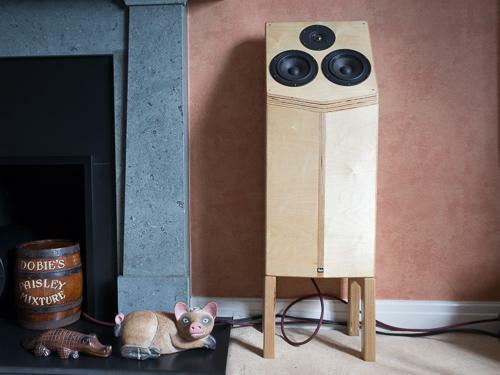 Although the carpentry is good and the varnish well applied, the visual properties of the wood are not as decorative as most loudspeakers in this price range. Since the review pair was manufactured, RMB has made a couple of small design changes. The drivers are now recessed into the baffle which will neaten the finish of teh baffle and the magnets which hold the covers are being replaced with larger ones to hold the covers more securely (the current one are fiddly at best). The binding posts are smaller than usual for a speaker at this price point. RMB recognise this in a note accompanying the speakers, saying that they are used specifically, in conjunction with silver solder as giving the best sound. Firstly I teed up John Mayer's album "Continuum". It's an album I like for its strong song writing and fantastic guitar tones. The sound with the RMBs is immediately different from what I'm used to. It's very punchy and forward. Mayer's vocals are slightly dry and the bass sounds very tight. It's clear straight away that these are impressive sounding speakers. I wanted to explore the bass further so switched to Paul Simon's Graceland album. The title track builds slowly before the bass picks up the rhythm then drives it long. The bass from the RMBs was easy to follow and engage with. Depth of the bass was surprising given the small drivers and light cabinets. Sticking to a folk rock theme – but more modern – I tried Ben Howard's album “Every Kingdom”. This features sweet acoustic guitars tonally similar to Paul Simon (but played in a John Martyn style). I thought maybe the guitar, say on Sweet Pine, was a little less sweet sounding than I'm used to. Vocals were even more up front pitching the singer right into the centre of the room. Different strands of vocals were clearly audible and the building intensity of bass and drums impressed. Next up was Sarah McLachlan's album "Surfacing". The second track, "I Love You", starts with a very deep bass synthesiser line that challenges many speakers. Here, whilst there was some boominess, it came across fairly naturally while the vocals drifted in delicately above it. Quite a pleasing presentation. Sticking with close recorded female vocalists I listened to some Mary Chapin Carpenter. The relatively sparse musical arrangements suited the speakers but I felt the vocals were less airy than I'm used to from my Ushers Be 718's and I missed some of the sparkle on the guitars. I definitely got the impression that I was hearing the room effects more than usual as the vocals boomed a little, making it difficult to pick out some of the vocal detail. Then I tried my favourite Diana Krall track, Narrow Daylight. The image overall was bigger than I'm used to but again there seemed to be a sort of bloom around the vocals which I suspect came from interactions between the room and the speaker. But the acoustic guitar break on this track was nicely articulated. The double bass underpinning the track sounded present and correct although it did fade in the lowest octave. I wanted to hear how the speakers got on with recordings of piano music. “Speed” is one of the professed design aims of the speaker and the leading edge of piano notes is a good test of this. I listened to some Keith Jarrett and the speakers gave clear insight into the music. I enjoyed the way, for example, in the Koln Concert album, the left hand rhythms were tight and percussive, and the delicate variations in dynamics came across well, making the overall sound very engaging. I also listened to Joanna McGregor and Andy Sheppard's album Deep River, which confirmed my opinion that piano music was well served by these speakers. Michael Nyman's “Drowning by Numbers” soundtrack presented strings naturally but with a hint of dryness. On rockier material – in this case Beth Hart's album, “My California” and the Counting Crows classic "August and Everything After" – the dynamics gave a presentation of real power and the overall image was wide and very upfront. I've long held that loudspeakers are the component that has the most influence on the overall sound of a hi-fi system. The RMBs really brought this home. The sound of my system with them in circuit is very different from my regular speakers. They also look very different. In my view, the appearance lets the speaker down and is likely to put off some potential buyers at this price. The speakers sound much better than they look though. The 22/3's are sensitive and handle dynamics very well. Bass was quite present and deep for a relatively small speaker albeit not the most detailed. Sometimes the image became almost too ‘in your face' and, on some recordings, sounded boomy in the midrange, which I suspect is an artefact of the amount of room interaction built into the design. Overall though the listening impression is of a very high quality, if somewhat quirky loudspeaker, favouring speed and presence over sweetness or delicacy of touch. I know from Mike's article that RMB have done well at hi-fi shows in the UK. If you should get an opportunity to hear a pair, I recommend you take the chance.